(Phys.org)—A fungus normally used to control insect pests may help honey bees protect themselves from a destructive mite by both infecting the mites and preventing suppression of the bee immune system, says a team of bee researchers at the University of Guelph. The Varroa mite is a devastating bee pathogen that, if left untreated, can kill an entire honey bee colony. Beekeepers typically treat their colonies with miticides to control the mites, but resistance to these chemicals has become widespread. The Varroa mite is believed to be a leading factor in the high winter mortality experienced in Canadian bee colonies in recent years. "Beekeepers have an urgent need for effective, bee-friendly Varroa treatments. Naturally-occurring entomopathogenic fungi could be an effective, biologically-based control method. They are non-toxic to humans and can be mass-cultured," explains Mollah Md. Hamiduzzaman, a post-doctoral researcher in the School of Environmental Sciences and lead author of the study. Hamiduzzaman and colleagues looked at gene expression in honey bee larvae exposed to regular mites and mites inoculated with fungus. 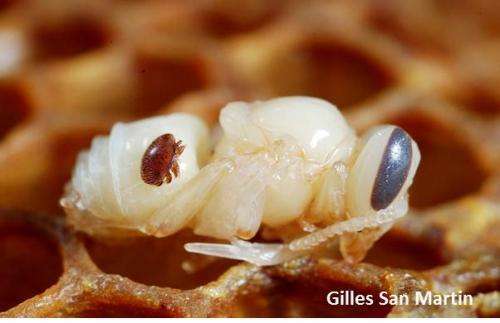 Infection with Varroa typically leads to lower expression of genes involved in the bee immune response, leaving bees less able to fend off the parasite. When mites were first inoculated with the fungus, however, expression of three important immunity genes jumped 2-3 fold over normal levels. "The results suggest that the fungi could reduce damage from Varroa mites by both infecting the parasites, and preventing the mites from suppressing the bee's natural immune response," says Hamiduzzaman. Because the fungi are natural insect pathogens, however, the honey bees can also be vulnerable to infection from the fungus. According to Ernesto Guzman, an entomologist and collaborator on the study, "the trick is to find a fungus that kills Varroa at doses that are relatively harmless to the bees". The team looked at several strains of fungus and identified one strain of Metarhizium anisopliae that causes high mite mortality (over 90%) and relatively low bee mortality (24%). Guzman says it may be possible to find other strains that are just as effective against mites but less harmful to honey bees. Another interesting possibility, adds Guzman, is to isolate the factors that trigger the enhanced bee immune response from the fungus. "These compounds could potentially then be applied to hives to trigger a natural defense against Varroa infections." Graduate student Alice Sinia and pathologist Paul Goodwin also collaborated on the study. The results have been published in the most recent issue of the Journal of Invertebrate Pathology.